Cliff Nightingale runs the maple farm with his wife Sally. 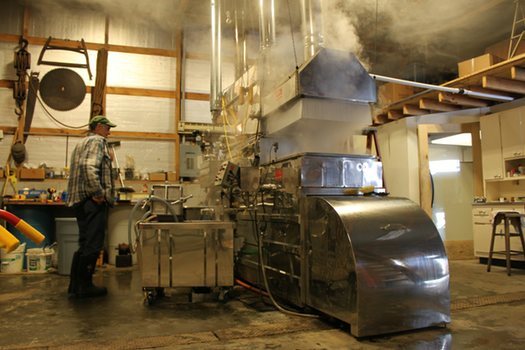 They've been in operation for 31 years, but Cliff's been maple sugaring for much longer than that. As a kid he'd tap the trees in his backyard and bring the sap in to boil. But when his mother's kitchen became a sticky mess, and wallpaper started peeling off the wall, she made him move his operation to an outdoor fireplace. Now he's got 30 acres of trees, and 11 miles of pipeline. 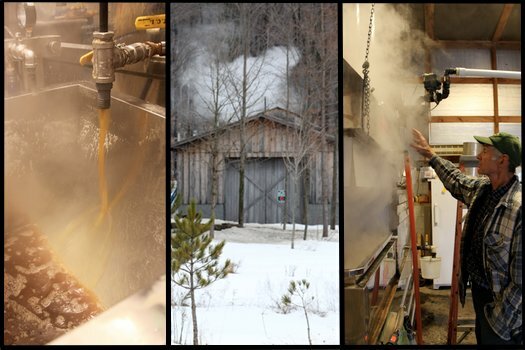 The pipeline brings the sap to his sugar house, where he spends close to 12 hours a day working during prime sugaring season. So why does he do it? He says with a chuckle, "At this point, it's what I know how to do." And then adds, "It's fun; it's play for a little boy, but it's play for a big boy, too." First, a maple tree must be tapped. That's usually done in mid-February. This year, because it's been so cold, it was done on March 8. Cliff says, "The season starts when the thaw starts." It's better for sap production if there are alternating thaws and freezes for many days in a row. There are different ways to tap a tree. 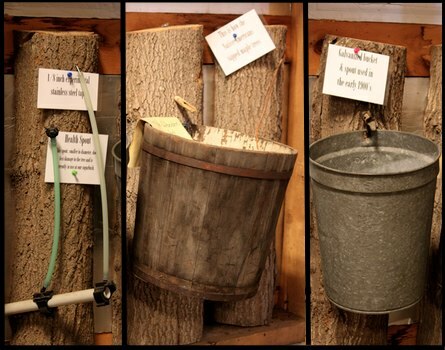 For home tapping, you can just drill a hole into the tree and let the sap drain from a tube into a bucket. Cliff says Native Americans chopped into a maple tree and used a stick to collect sap. 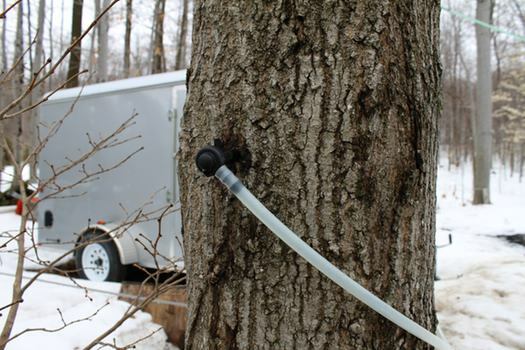 On his farm, they use a spout designed to protect the health of the tree to collect the sap, which then gets vacuumed into a holding tank, and then into the sugar house. 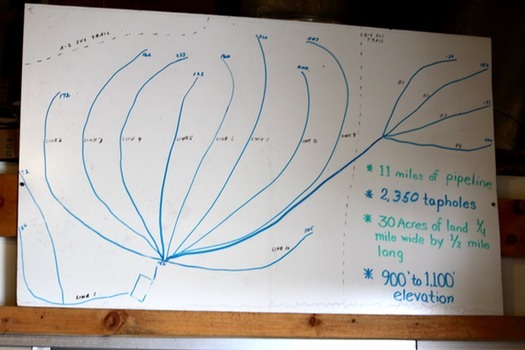 They have 11 miles of pipeline going through their thirty acres -- and 2,350 tapholes in trees. 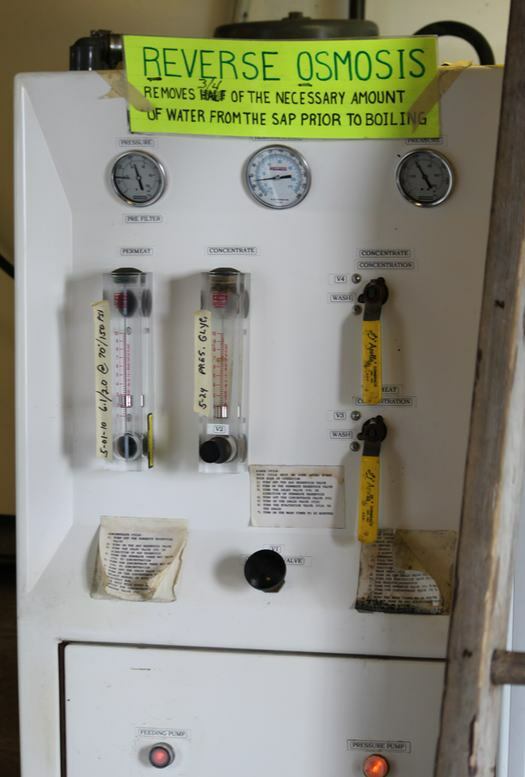 The sap then goes through a sterilization and reverse osmosis process to take 3/4 of the water out. 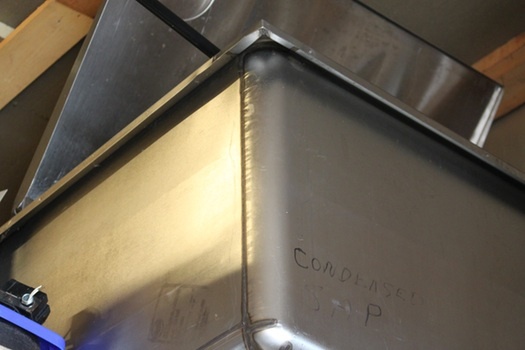 From there the condensed sap goes into another tank. 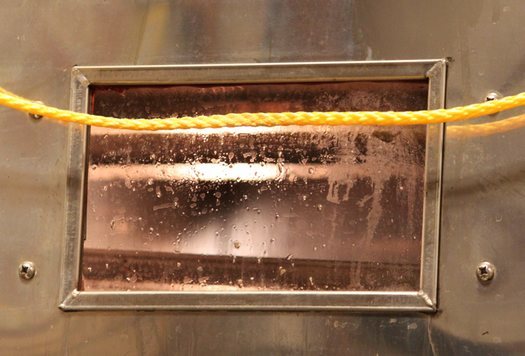 Then, through gravity, it makes its way to the evaporator. 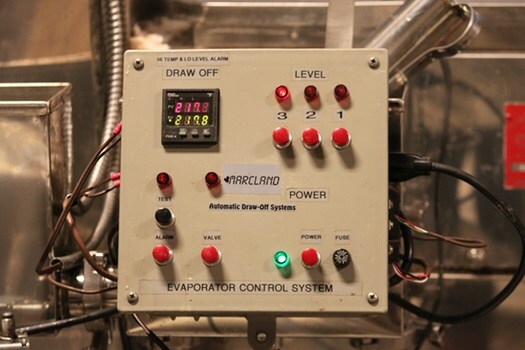 The sap boils in one part of the machine first at 212 degrees Fahrenheit - the temperature water boils at. 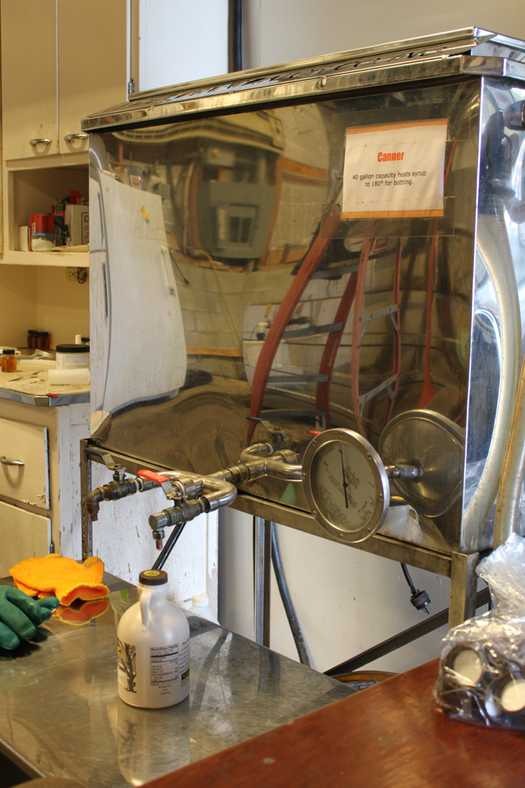 And then it goes into another part of the evaporator where the temperature will reach 218 degrees Fahrenheit -- the point at which it will become syrup. It was exciting to watch the temperature gauge reach 218. When that happens, the syrup pours out of a faucet and into another tank. 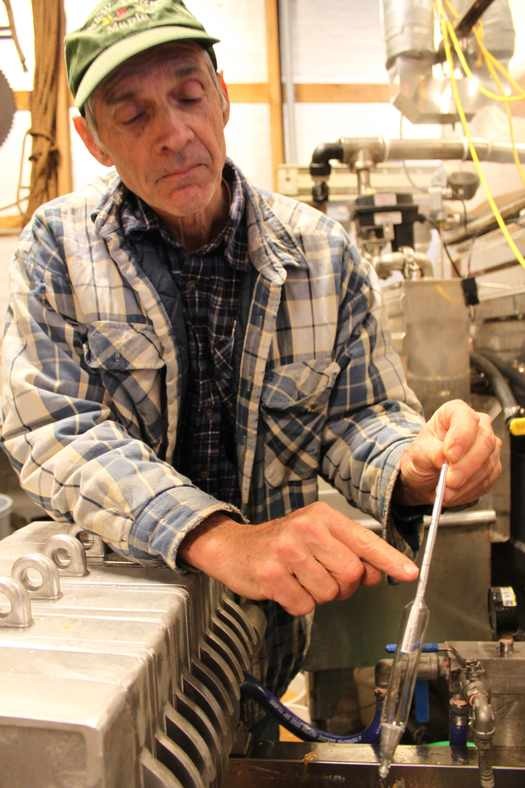 Cliff uses a hydrometer to test the syrup sweetness. It's measured in brix, an expression of the syrup's sugar content. He's looking for 67% -- if's it more than that percentage, he'll add a little more sap. 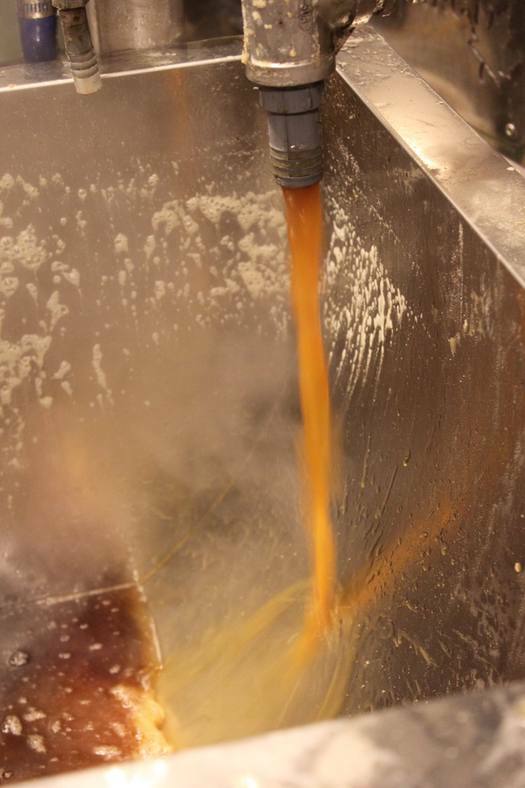 At this point the syrup goes into a drum or into the canner. And from there, it becomes your favorite maple treat (maple cream and candies require a longer cooking process). Cliff sells his syrup (Grade A: light, medium, and dark amber; and Grade B), cream, jelly, candy and maple covered nuts on site. 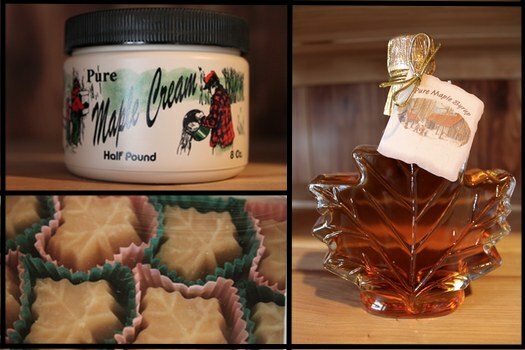 Nightingale's Maple Farm is open for retail sale Monday through Saturday 10am - 5pm. 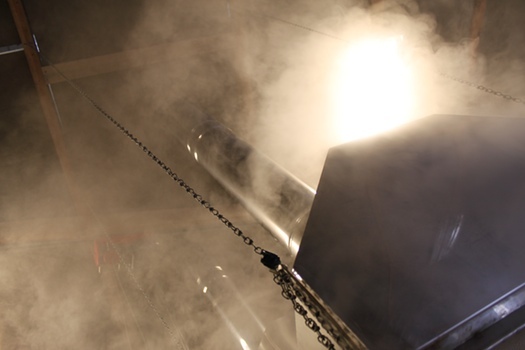 This weekend many of New York's maple farms will be open for tours for New York's maple weekend, including Nightingale. Here's a list of participating farms, sorted by county. 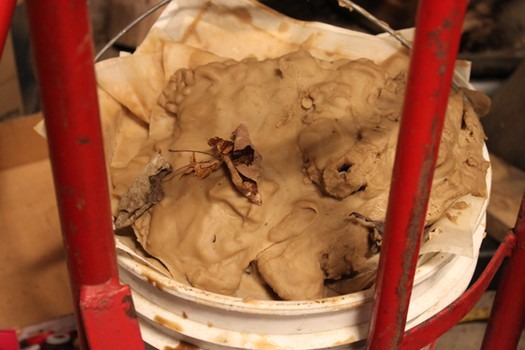 This gave me a flashback to a field trip I took to a maple sugaring place. I can't remember if it was through school or girlscouts or what, but I remember thinking the process was really cool! Thanks for the refresher. The scientist in me loves this post! Now I want some maple syrup! "New York â€˜s senior U.S. senator, Charles Schumer, has asked IHOP to stock New York-made maple syrup in all of its 44 locations in the state, a call prompted by the pancake chainâ€™s recent commitment to use Vermont syrup in its (for now lone) restaurant in the Green Mountain State." This link contains the full text of Shumer's letter, for you agribusiness/political types: http://blog.timesunion.com/tablehopping/6086/schumer-to-ihop-serve-new-york-maple-syrup/. We're snooty about our maple syrup around here and we should be it's made from the NorthEast's greatest natural resource - trees. Very nice story and really appreciate the supporting photos. ever hear the NPR story on the subject? what happens when the maples go untapped? A friend has tapped 4 or 5 maple trees in our suburban yard for the last several years. He boils up the sap in a huge pot on an outdoor stove, without all the fancy equipment that the pros use. It's hard work, but it's pretty cool to have maple syrup that came from your own trees! Thank you for the interesting/informative story. It is a great outing to see the trees tapped, dripping nature's goodness into the bucket. Maple syrup is good on just about anything. Derryx! What did you do to that scientist!? You better let him out! That NPR story is fantastic! How did I miss it the first time around? I semi-sorta learned all this fun stuff when I attended the NYS Ranger School in Wanakena (shameless plug for a unique college experience), and I realized then, that I love to eat it a lot more than make it! !